Renault's modern art collection, mostly acquired from 1967 to 1985, comprises some 300 works by major artists including Arman, Dubuffet, Tinguely and Vasarely, visionaries who in the late nineteen-sixties drove a real change in the place held by art in modern society. The technological, cultural and social effervescence of this period proved conducive to what then appeared a most improbable rapprochement between the seemingly opposed worlds of art and industry. In putting together its art collection, from 1967 to 1985, Renault would take a highly original approach, differing from the classic arts patronage norm of simply buying finished works. Altogether more ambitious and pragmatic, the aim would be to develop active cooperation between pioneering artists and a pioneering company, a major driving force behind French industry at a pivotal point in the country's history. Renault would provide the artists with technical, logistics and human support. The adventure began with Arman. His works made frequent use of everyday objects, and he was enthusiastic about the prospect of working at the Renault plant; there where technology was happening, he'd discover a wealth of new materials and forms. The initial concept of a vast industrial artist's workshop opened the way to other creative partnerships, with intriguing and powerful results: Renault would supply car parts for César's “expansions”, its engineers would provide expert input to the technical queries of artists like Vasarely and Dubuffet, and there'd be plenty of material for Rauschenberg and Tinguely's ironic pieces on the debris produced by industrial societies. The artists whose works feature in the Renault art collection enjoy worldwide recognition today, but that was not necessarily the case when Renault first contacted them. With this pioneering arts project, Renault was boldly stepping forward as a true patron of the arts rather than a mere collector. French photographer Robert Doisneau is widely considered as one of the great humanist photographers of the twentieth century. He began in the modernist school, soon opting for a photographic approach that emphasized scenes from everyday life. Doisneau virtually began his career as a photographer with Renault. He was hired at the age of 22, with two duties: to photograph the plant (machinery, workshops, production lines) and the people working there (canteen, dispensary, kitchen, apprentice school, etc. ); and to produce shots of the cars for use in the fast-emerging field of advertising. As well as reporting meticulously on the intricate details of industry in operation, Doisneau's photos also include endearing portraits of the people who keep the wheels turning: standing small alongside the mammoth machinery, but with dignity undaunted despite the anonymity and the drudgery of their repetitive tasks. 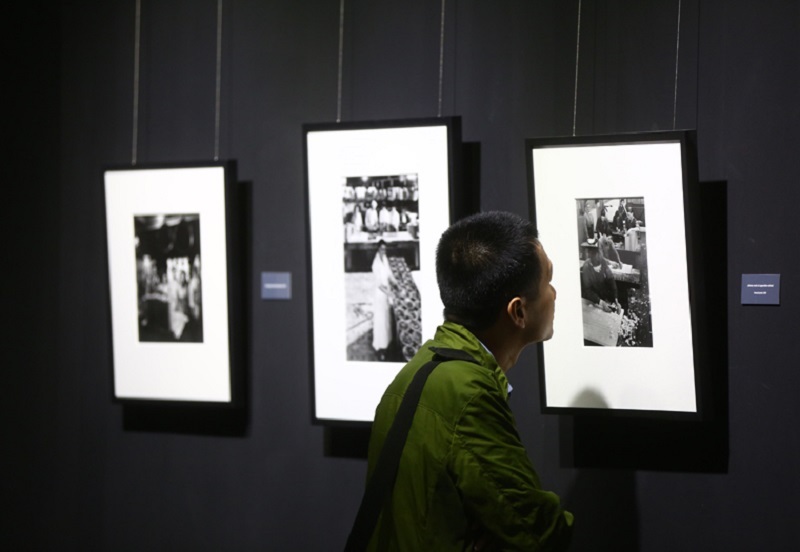 Despite the strong suggestion of the soul-destroying destiny of industry, in the repetition of inanimate objects saturating the field of vision, the underlying force of Doisneau's works at this period remains the irreducible specificity of the Lilliputian silhouettes bustling around them. French painter and sculptor Arman was a founding member of the New Realists group. It was in contacting Arman in 1967 that Renault took its first step toward building its art collection. Arman would actually come in to work at the plant (“my colour shop”, as he called it), most enthusiastic about the prospect of being able to test out his production/consumption/destruction triptych on industrial objects in their native environment: “my creative appetite was aroused by discovering how these objects were made and prepared prior to being assembled”. Arman's works under the patronage of Renault's Research, Art and Industry Department fall into three broad categories. First, we find meticulous arrangements of parts selected by Arman, as in Accumulation Renault n°114, formed from fan blades. Second, we have chaotic compositions such as Accumulation n°115, featuring the Renault badge, which disconnect the viewer's usual spatial location references to impose their own norms, unexpected and unsettling. Third, and most spectacular, we have Arman's more sculptural works made from body parts, such as the absolutely colossal Accumulation Renault n°152. The cooperation between artist and automotive industry would be literally set in stone when two six-metre-wide walls of Arman's accumulations were built into the architecture of Renault's new headquarters in early 1974. These works, formed from sawn cylinder heads set against a black background, are astonishingly lively and harmonious. Arman's works consistently imply an analysis of the loss of identity that arises out of mass production. As the artist commented, “in getting to know the factory —I mean I was almost living there in a way— I realized the need for a form of modern existence”. 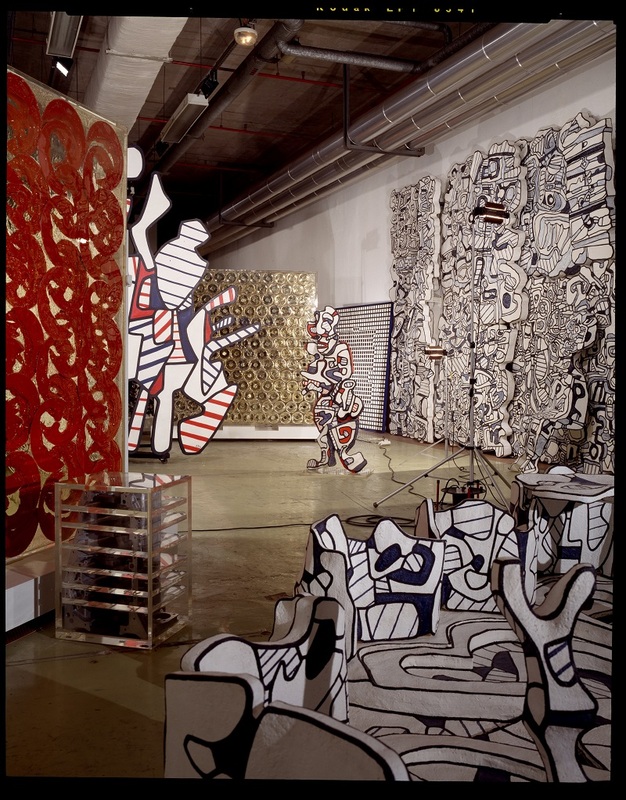 French painter and sculptor Jean Dubuffet is generally considered to be the originator of the Art Brut movement. For his Hourloupe Cycle, he deliberately restricted his palette to three colours: red, blue and black. And as well as this chromatic constraint, he also experimented with “inhabitable” monumental art, making extensive use of new materials with strong industrial connections, such as polystyrene, expanded polyester and synthetic resins. When Renault contacted him in 1973, the proposal appeared perfectly in tune with his artistic orientations at the time. Dubuffet made full use of the technologies and engineering know-how available from Renault in order to produce some of his most audacious works. To prepare mock-ups for his huge inhabitable sculptures, he'd have access to Renault's Delta 3D machine, more usually applied for car prototype design work. Roman Burlesque (a suite of 18 works specially designed for the Renault halls) is one the masterpieces of the artist's Hourloupe Cycle. The next cycle, starting with Paysages Castillans, brought a change in palette and a return to classic rectangular format. 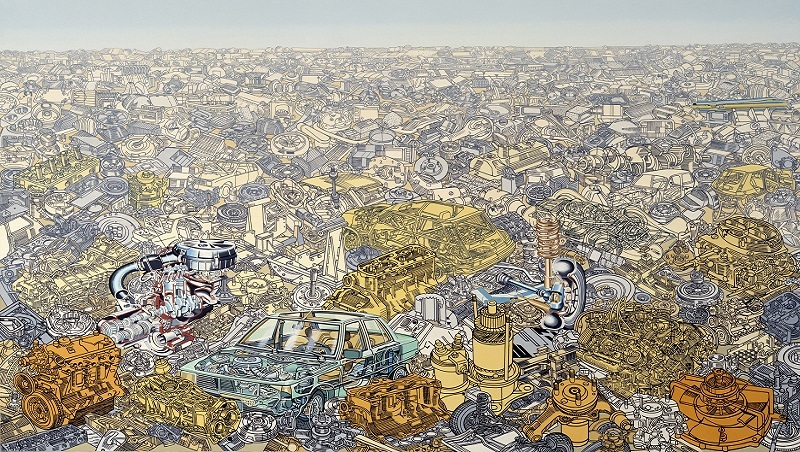 In many of Dubuffet's major works, artistic genius is backed by Renault industrial technology. 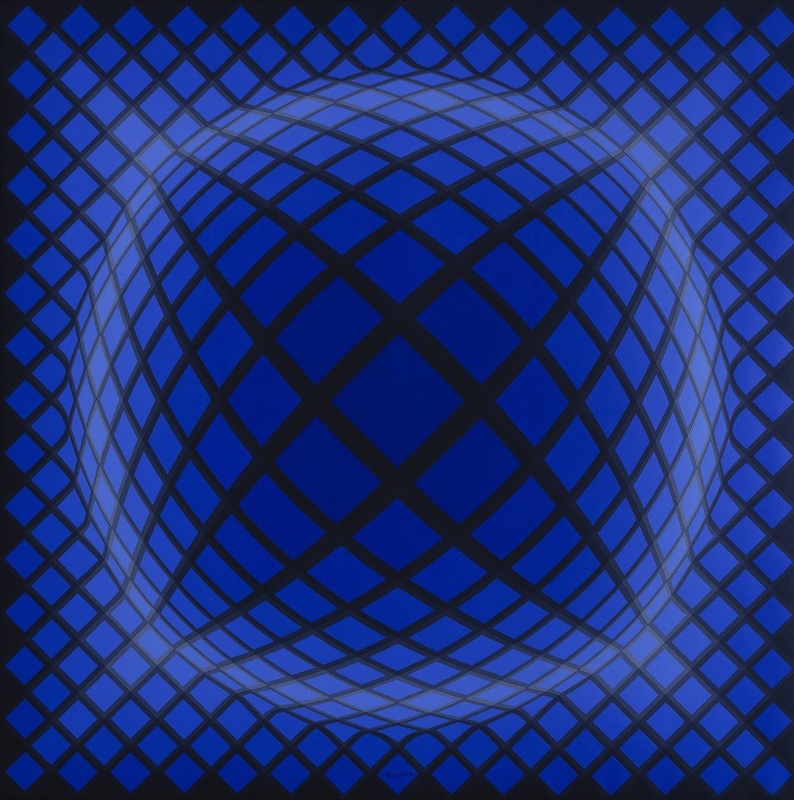 Hungarian-born Victor Vasarely was the founder of Op Art, a movement focused on the aesthetics of movement, highly influential during the second half of the twentieth century. Renault's cooperation with Vasarely began in 1967. Vasarely had a background in graphic design and advertising, and in 1972 Renault commissioned him to redesign its logo, a project the artist would undertake with his son Yvaral. The new badge would keep the characteristic diamond shape, but drawn in clear, dynamic, angular lines. Years later, this archetypal “seventies” look would morph yet again into a more rounded form, consistent with a shift in Renault's vehicle design stance. The Vasarely-Renault partnership would also have a roadside component. For Vasarely, “the motorway accomplishes a happy marriage of natural and artificial landscapes”. Working from this principle, Vasarely called in Renault technology to design giant panels that would be erected in motorway roadside locations. When asked for advice by the artist, Renault's paint laboratory recommended enamelled sheet metal as a weatherproof solution. This kind of knowledge transfer exemplifies the kind of relationship developed between Renault and its artists. Icelandic painter Erró (born Guðmundur Guðmundsson, born in 1932) settled in Paris in 1958, where he soon began to develop a high-realism figurative vocabulary drawing upon mass-culture imagery, merging into a European form of Pop Art that echoed the US movement of the period. When Renault approached Erró in 1984, the artist plunged delightedly into the company's huge image base to produce a series of emblematic works that blend a historic style with content from a modern automotive world. Erró recalls his cooperation with Renault as “as a sort of idyll with not the slightest hitch”. Painter and sculptor Jesús-Rafael Soto was born in Venezuela and settled in Paris in 1950. From 1955, he worked with artists such as Vasarely, Tinguely and Le Parc on the Le Mouvement exhibition, which marked the birth of the Kinetic Art. Soto's works are rooted in the notion of space and its interaction with visual perception. Space can be encompassing, restricted, distorted or sublimated. 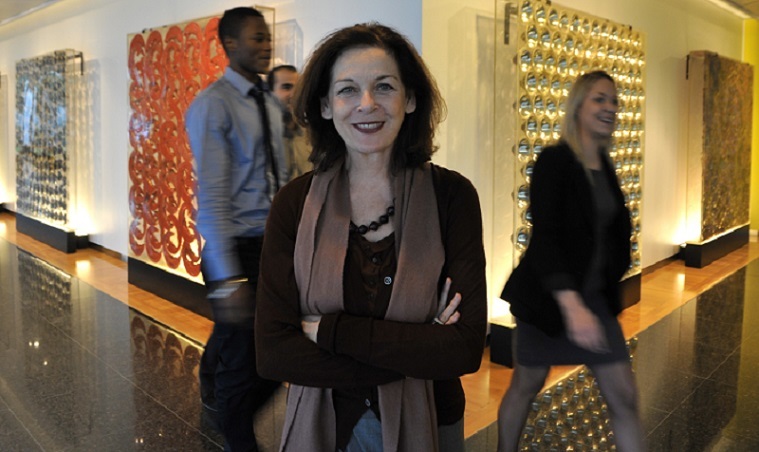 The artist explores all such variants: “That's the leitmotif of my work”. 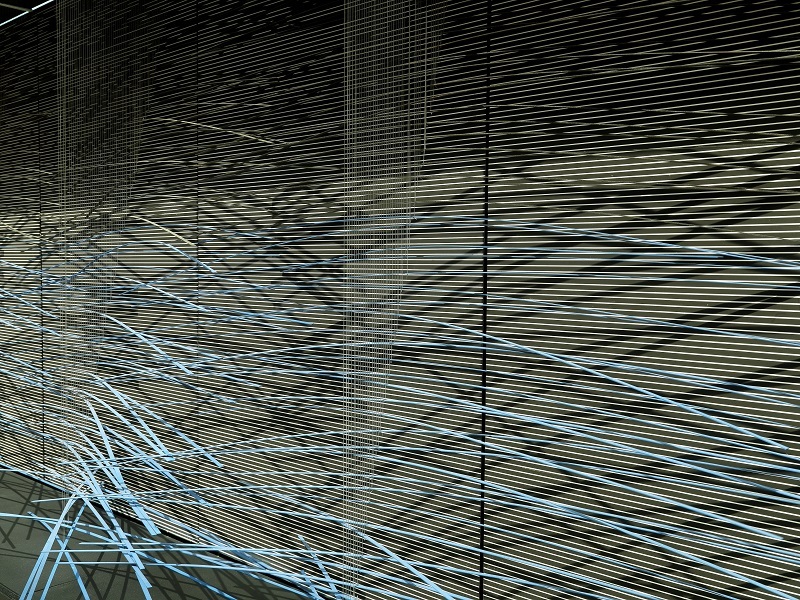 Soto's space is in constant motion, eliciting closer and deeper exploration by the viewer. In 1974, Renault invited Soto to pursue his investigations into space on the Renault premises. Specifically, he'd be working on the reception area and canteen of the company's new headquarters. Soto was delighted by the functionality and openness of these locations. Renault's commission was classic, though no less pioneering in scope. Given its function of great expressive importance, the reception area would be required to convey the values of technological excellence, modernity and authority, consistent with Renault's status, at the time, as a major state-owned company. Swiss artist Jean Tinguely was a key member of the New Realists movement. He went to school in Basel in the nineteen-thirties, and exhibited widely in France and Switzerland after the war, attaining worldwide recognition in 1960 with his Hommage à New York, a gigantic machine made from scrap and set to spectacularly self-destruct in the garden of the New York Museum of Modern Art. His works often involve improbable assemblies of diverse objects, forming black machines that produce unexpected motions. As a excellent mechanical engineer in his own right, Tinguely appeared an ideal choice of artist for Renault. Works by Tinguely under Renault's patronage include Requiem pour une Feuille Morte, produced in 1966 for the Montreal Universal Exhibition. This monumental sculpture is a gigantic black construction in wood, leather and metal. 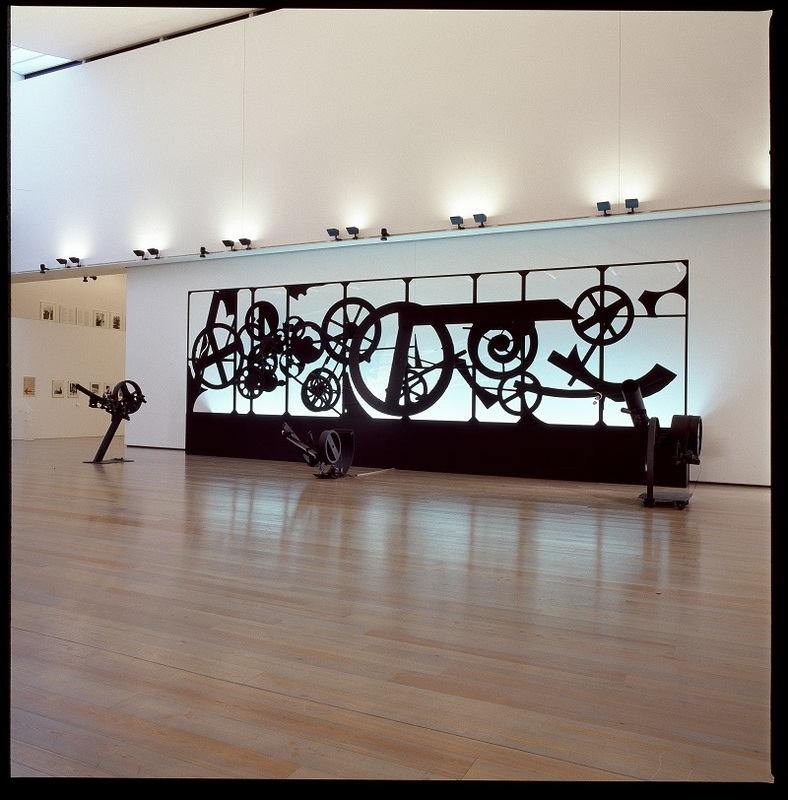 Tinguely's enthusiasm for the motorcar shows through in Pit-Stop (1984-1985), a sculpture made from engine and body parts of Formula One racers, selected by the artist at the Renault Sport plant and put together in a hangar rented by Renault.